Nora – Home of the Charcoal Tarts! Nora is a newly opened Thai inspired bakery and café, located on Elgin Street in Carlton. Owned by couple Jean Thamthanakorn and Sari (Tong) Rojanametin who are each individually responsible for various elements here at Nora – Jean for her spectacular charcoal tarts and Sari for his magnificent homemade sourdough. Tong is a former artist and photographer and has previously worked in the coffee industry for a few years with stints at St Ali, Seven Seeds and Traveller. Most recently he has pursued cooking and worked at The Commoner, Longrain and Mr Nice Guy. Jean is a tax accountant as well as a self-taught baker and has honed in on a skill of baking over the last few years by baking for family and friends. It was Jean’s love of baking and her inventiveness that brought above the creation of charcoal tarts. These charcoal tarts are seriously better than cronuts and will certainly take not only Melbourne but the rest of Australia by storm – they are amazingly divine! The tarts have a distinctive black pastry shell which is achieved by the addition of small amounts of food-grade activated charcoal which is made from coconut husks. Food-grade activated charcoal is safe to ingest and has reported healthy benefits such as being a detoxifier. The tarts are filled with a variety of flavour combinations that have taken inspiration from the couples South East Asian background. Flavours include Lemongrass & Ginger Brûlée, Coconut Pandan, Strawberries with Tamarind Cream Cheese and Kaffir-Lime Custard with Sour Cherries. Get in quick each day as Jean only makes a limited number (around 100 a day). The menu at Nora is simple; but reads and shows the depth of experience and advanced techniques of an experienced chef. There are six dishes to choose from – Our Water + Salt, Egg, Salmon, Bacon, Rice and Nora Flakes. Don’t be fooled by the simplistic mostly one worded headings, as when you read the elements that go into making that entire dish you will be impressed. For example the Salmon has been lightly smoked and jasmine cured, and is served with coconut, nashi and nasturtium. The Our Water and Salt comes served on a cute wooden tray with house made sourdough, semi churned butter, chicken-liver parfait together with ricotta and jam. The Nora Flakes consist of puffed polenta, wild rice, quinoa and crystallised nuts – and if you have seen any pictures they have a great marketing tool which is a mini-box with NORA MORN FLAKES plastered on the front. They also serve a great selection of teas with Small Batch coffee being pumped out of their La Marzocco machines. The interior of Nora is light filled, airy and very modern. As you step inside you are greeted by an illuminated sign with the letters NORA lit up. The next thing that catches your eye is the shiny new La Marzocco coffee machine, together with coffee smells in the air. A point of difference at Nora is the white table topped wooden table that have ingredients displayed out in an artistic manner which entices you to go over. Over to one side is a bunch of lemongrass paired with lemons and ginger. Just above this is a whole coconut, paired together with charcoal and the coconut husk base. There are also other ingredients paired together such as eggs, chocolate and sesame. Their décor is simple and minimalistic yet captures ones attention. Tables are wooden and low paired with stylish round stools – and can seat from two to four people – there is limited seating available outside. From most tables you can take a sneak peak into the preparation of your meals as it overlooks the main counter. I ordered a latte to start which was full bodied, aromatic and delicious – with notes of citrus and nuttiness. The perfect pick me up and start to what would be a great meal! I was tossing up between the SALMON and the EGG and decided to go with EGG dish. This dish comes with Egg cooked in Nora’s special way, House Chilli Dressing, Garlic, Salted Shrimps and Thai Greens. I was very interested in seeing what Eggs done Nora’s way would be like. The dish came out with the Asian Greens dominating the round, deep plate, with the Egg hidden underneath. The House Chilli Dressing, Salted Shrimps were placed sporadically around the Egg and Asian Greens. The Asian Greens were refreshing and a very distinct Thai flavour to them – I loved the variety of greens that were use, they all worked seamlessly together. The Egg itself was reminiscent of tofu – smooth and silky and easy to eat – paired with the house chilli dressing – which had the perfect level of spice – together with the saltiness of the shrimps – was really delicious. It is the type of dish that makes you keep going back for more. A definite highlight of the dish was the freshly made sourdough bread that came served in its own cup off to the side. The bread was heavenly – soft and fluffy on the inside, crunchy and texture on the outside with just the right amount of saltiness. It was that that great that I later asked how they made this bread – if only I was that skilful! You cannot leave Nora without trying their signature charcoal tarts. I was worried as I knew that only a certain number was made; and I had arrived about an hour and a half before closing time. However I was in luck, they still two flavours left and I opted for the Kaffir-Lime and Sour Cherry Charcoal tart. When it comes out to you it is covered with the silver dish that it would have been baked in to create the element of suspense and surprise. The unveiling of the charcoal tart builds up anticipation and delight. Once uncovered, the brilliant blackness of the tart is revealed along with bits of crumble and pistachio that surrounds the main black beauty. Once you delve into the tart you are greeted with the distinct Thai flavours (Kaffir Lime in this case) paired perfectly with a western element (Sour Cherries). The tart filling is gooey, smooth and velvety all at the same time. What makes these tarts especially amazing is the charcoal casing itself – it is flaky, crisp and soft – it literally melts in your mouth and you really could find yourself eating tart after tart after tart. The perfect addition of pistachios and crumble added texture and depth to the tarts. I cannot wait to come back and sample all the other flavour varieties. Nora is a great new addition to the Carlton area – especially bringing Thai inspired breakfasts into the mix. Their signature charcoal tarts are (in my opinion) better than cronuts and would recommend anyone and everyone to try them – after all the charcoal used does have some health benefits! Get down to Nora now! I follow St Ali North on Instagram and saw a post about a Truffle Masterclass being held– it was to be hosted in collaboration with Pasta Classica, Pepe Saya and Madame Truffles. Pasta making, Butter making and learning all about truffles were to be covered and Entry was Free – so I decided to RSVP and check it out. I arrived at St Ali – this was my first time to St Ali North, I have previously been to St Ali in Carlton – and there were quite a few people already present. The fit out was very modern – complete with an array of windows and wooden ledge seating. I can just envision what it would look like during the day – for breakfast and lunch – with the light streaming into the venue and enveloping the entire venue in a positive and relaxed vibe. The masterclass was carried out in the main dining area – situated past the main counter/bar. Chairs were set up in order to sit and enjoy the show. Before the show you got the chance to enjoy some free canapés – which included a Stuffed mushroom and Sourdough as well as Bread with Truffled butter – both of which were delicious! You also got the chance to chat to “Madame Brussels” and learn as well as ask questions about the wonderful world of truffles. She showed us different truffles from around the country and explained the difference in smell between the truffles that come from the varying states. She also gave out ideas of how you could use truffles in everyday cooking such as topping your breakkie eggs, using them over a linguini mushroom pasta or even mixing it with butter and serving it with some lovely sourdough. Madame Truffles also informed us that they were experimenting with the use of truffles in the sweet world. They had white chocolate and truffle macaroons for sale on this night to purchase and sample. Since the Masterclass , more experiementing has been done and I have seen that they have created Monte Carlos using truffles as well (via their Instagram) – I cannot wait to see what else they experiment and create. You can follow their updates by following their Instagram at madametruffles. The Masterclass started off with a talk from Madame Truffles enthusiastically telling everyone about the wonderful world of Truffles as well as interesting facts about them – such as it can take up to 10 years to grow truffles and in order to track down and find Truffles they use dogs! Another thing to note about truffles is that the bigger the aroma, the better the truffle and the more expensive the truffle will be. She then passed around different types of truffles for us to smell. Later I learnt that the price of truffles (on that day) was upward of $3.50 per gram! Expensive indeed, but when you taste the unique flavouring you start to understand why. Madame Truffles’ are freshly harvested each weekend and sourced from the very best truffleres in New South Wales, Western Australia, Tasmania and around Victoria. SHOP? Following on from Madame Truffles – was a hands-on demonstration by Pasta Classica’s Daniel Tonin on the art of making pasta. Tonight the star of the show was the Tortelloni (Tortellini are the smaller size pasta parcels, whilst Tortelloni are the larger variety). Tonin informs the class that in order to make pasta all you need is two ingredients – 400g Italian “00” flour (or plain flour) and 13 egg yolks (no whites!) – you may also want to add a pinch of salt as your liking for taste. I never knew that making pasta could be so easy! The egg yolks are what give the pasta its colour and flavour. The technique to create the pasta is to place the flour on a clean bench and make a hole in the centre – here you place the 13 egg yolks. Then using muscle power, knead the mix through. If you rather you can use a Kenwood mixer instead. Tonin then showed us how the correct way to pass the pasta through a pasta machine in order to get the right thickness of pasta. After this he then shows the class how to make the tortellini shape once we have rolled out our pasta. After each stage in the pasta making process, Tonin passes around the pasta to allow us to touch and feel the texture that it is meant to be – I find this to be very useful as you get a better understanding for when you try and make it at home. Tonin also gives us a recipe for the filling inside the tortelloni – this filling consists of Potatoes, Pepes’ Butter, Parmesan Cheese, Tallegio Cheese, Thyme, Garlic with Pepper and Salt for taste. We are told that we will be sampling some of Tonin’s handmade pasta later on. Yum! Next up in the Masterclass is Pepe Saya who takes us through a butter-making demonstration. Saya starts off with giving us back ground into the butter making process. The butter making process commences with the use of sour milk, to this you add the bacteria Lacto Bacilis and let it ferment. The result of this is crème fraiche. If you keep crème fraiche for around 3 weeks and then scrape the mould – the end result will be Buttermilk. Buttermilk is mostly commonly used in pancakes – and it is what gives the pancakes its fluffiness as a result of its reaction with the yeast. I never realised that it was it was quite an easy process to make butter at home if you wanted to. You can start off by using bought Crème Fraiche from the supermarkets, mixing this in a Kenwood mixer. You will start to see butter forming after a few minutes – this is what is called butter in the popcorn state – as it resembles kernels of popcorn. You will find that Buttermilk is also produced – and this is what the Popcorn State butter will be sitting in. You will need to wash the Buttermilk out with Filtered Cold Water. Once you have the popcorn state butter on its own – you can knead it together and serve it up. You may also want to put some salt in for taste, unless of course you are after unsalted butter. We then got to taste the butter that Saya had just made – it was creamy and very fresh! This girl can sing and her voice is amazing! On the night she had only the backing of guitarist Mat Fagan – which allowed her true vocal skills to shine. Definitely go and check out where she will be performing next. I met some really fun and food loving people and learnt a lot from this Masterclass. Pasta Classica had their products for sale and I bought the Ravioli with Feta, Parsley and Lemon Myrtle. Danny told me a simple way to cook with this pasta is to toss it in some oil and grate zucchini over the top and you have a really great dish. This is what I did and true to his word – it was delicious! The combination of the lemon myrtle was a real highlight and worked fantastically with the sourness of the feta and flavours of parsley. I will definitely be checking out their store to see what other unique and interesting flavours they have. It’s really great to know of a place that makes pasta fresh daily – in a variety of flavours that cater for any dietary requirements. 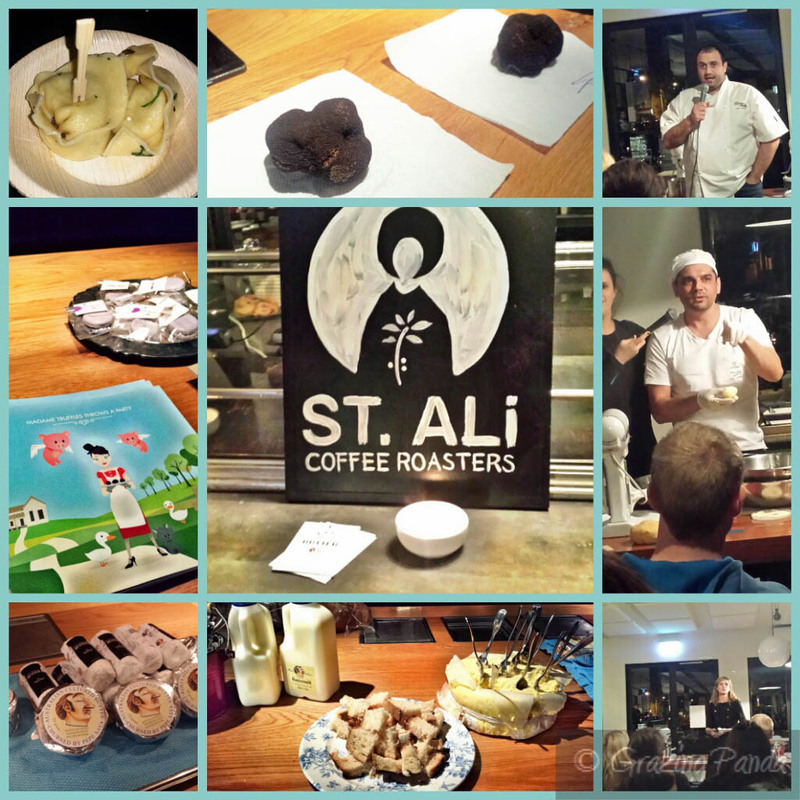 I will definitely be keeping an eye out for more Masterclasses organised by St Ali in the future and would recommend everyone try this one! Madame Truffles winter shop opens for six week during the peak of the Australian truffle season. Dates: Thursday 3rd July to Saturday 9th August, 2014. Burma Lane has newly opened in the venue that once used to be Mahjong Black – on Little Collins street – and serving up traditional Southeast Asian flavours from Burma. This new venue comes from the people who brought us Red Spice Road – Adam Trengove and Shaun Moorhouse. The interior hasn’t changed too much from when it used to be Mahjong Black but there are accents of Burma all around the venue. The signature style of Red Spice Road with large paintings of women continues upstairs here at Burma Lane with four colourful portraits of women on the back wall. There are birdcage light fittings as well but the centrepiece is the iconic “Freedom to Lead” image of Burmese opposition leader Aung San Suu Kyi by Sherpard Fairey– which is on the right hand side wall as you walk into the venue and go up the stairs. There is seating downstairs as well upstairs in this split level venue which consists of wooden table and chairs, finished with terracotta coloured plates that sit on top of the menu. There are also tea-stained posters which have been pasted onto one of the columns where the stairs are, and there is also a wall of holiday pictures from Burma. The menu consists of several small bites, noodle dishes (there are four to choose from), salad dishes (five to select from), and then has bigger bites and finishes with desserts. The bigger bites consist of mostly curry dishes, and come with a bowl of rice and cover most meats – fish, goat, beef, egg, prawns and pork – take your pick. 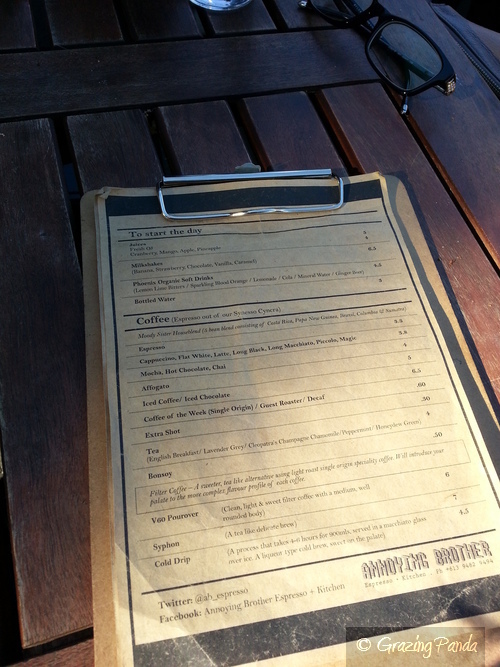 The drinks list is impressive and there is even a section for mocktails which I thought was great. There are drinks like Land of Milk & honey, Swami Delight and Thai Dai. I ordered the Thai Dai which had Lychee Juice, Pomegranate Juice, Kaffir Syrup. This drink is quite refreshing and came topped with a passionfruit piece which a nice way to finish the drink off. I also got to sample the Swami Delight – Apple, Indian Yoghurt Cardamom Syrup, Agave. This drink was very tasty and was a different take on the original Lassi as usually you have Mango lassi, but this consisted of Apple, Cardamom and Agave – the result was a fantastic tasting combination. I would definitely recommend trying out these mock tails. As we had more than 8 people we had to do the 4 course set menu which I thought was quite reasonably priced at $30. For these 4 courses we received – 2 small bite dishes, 1 noodle dish and 1 bigger bite dish. There is also a Chef’s tasting menu called ‘Taste the Best of Burma’ which costs $65. These options are quite wise as you can get a bit overwhelmed with the menu selection as all the dishes and their combination of ingredients sounds so enticing. There are so many dishes that I want to come back and try especially the Potato Cake which is filled with Slow Roasted Lamb Belly, Cabbage and Minty Yoghurt – how amazing does that sound! And on another note what I also love about Burma Lane is that the meat is certified halal – so I can actually have a majority of the dishes! The first dish that we were brought out was Kun Sar Thi – Betel leaf with chicken, shallot, green mango & Sichuan pepper. The dish came out beautifully presented – with the chicken, shallot, mango mix placed in a bowl in the centre with the betel leaves surrounding it. We were told by the waiter that we were to place the chicken on top of the betel leaf and eat them together. The result was a flavour hit in your mouth together with the crunch of the betel leaf. The flavour combinations were unique and delicious all at the same time. Next up was the Chargrilled ginger, turmeric chicken chops with lime & chilli – these came out looking glossy and perfectly grilled in a terracotta bowl together with a piece of lime and topped with chilli. The chicken was pretty good but not fantastic. The outside flavouring and coating of the chicken was delicious however, the inside was quite bland to me. I should also mention before we were given our dishes, the waiter brought us out 3 different types of sauces and chutneys and explained what was in each of them as well as giving us the spiciness rating. I thought the idea of this was quite fantastic. What made this even better was as each dish was brought to our table and explained to us – he would tell us which one of the three sauces would match perfectly with each dish. Ingenious! Back to the chicken – it was a great snack dish and together with the desired sauce was overall a great dish. Next we moved onto a dish from the noodle section and were given the Fat rice noodles with tofu puffs, spicy coconut broth, greens & bean sprouts. The first thing you notice about this dish when it comes out is that it is fresh looking and very colourful (especially against the black backdrop of the bow) and it draws you in immediately making every tastebud on your tongue water. And when you take that first mouth, it definitely doesn’t disappoint. This dish is semi wet dish thanks to the spicy coconut broth and the combination of flavours is fantastic. I really enjoyed this dish and especially loved the combination of the tofu puffs. The last dish that we had was the Rockling cooked in turmeric, lemongrass & tomato with noodles, mustard greens & egg AKA Funky Mohingha, our take on a Burmese classic. From having read up on people who had previously been to Burma Lane – this is their signature dish – so I was so happy to know that they featured it on this 4 course menu. Once again fantastically presented – with egg halves bopping in the tangy and tantalizing looking gravy along with the pieces of rockling – it was a dish I couldn’t wait to try. You get the waft of the lemongrass and tumeric as it was placed on the table, and these flavours carry thru as you take your first bite. The rockling is soft and tender and is complimented with the flavours and literally melts in your mouth. This is definitely a dish to try and is a true testament to Burmese cooking. Despite initially thinking that we wouldn’t be full from the meal we were quite satisfied and didn’t have any room for dessert. Desserts ranged from Sago and Coconut Pudding, Pandan and Coconut Jelly with Jasmine Rice Ice Cream, as well as Coconut Ice Cream on its own. Burma Lane is a great new addition to the Melbourne CBD food scene and truly brings you flavoursome and authentic Burmese food – ranging from small offerings to their larger dishes of tantalizing and deliciously aromatic curries. Another thing to note about Burma lane is that they support a number of charities through Pomelo, which is an umbrella group that provides practical training and financial aid to disadvantaged communities in Burma. Great food and supporting charities back in Burma – what more could you ask for? Atmosphere / Ambience: Classy, Elegant yet Relaxed and a great place for entertaining or even just catching up with people. Service: Friendly, Helpful and very Knowledgeable. They are happy to help and really do the menu inside out. N & I headed to Code Black Coffee on a Saturday for brunch. Code Black Coffee is one of the latest cafes to open up in the Brunswick area and is located off Sydney Road, behind Barkly Square shopping centre. Code Black Coffee is not only a cafe but a roasting house as well – with roasting equipment present on site. Code Black Coffee comes to you thanks to Joseph Haddad who is the man behind the Cafenatics stores that can be found all around the Melbourne CBD. The chef behind the deliciously flavoured menu is Laura Neville and makes you want to try out all of the dishes. Code Black Coffee exudes elegance and class yet staying casual and welcoming from the moment you step inside. As the name suggests, the main colour theme is black together with an industrial metallic and stone feel. When you walk inside the main feature you are greeted with is the large counter and barista station which in the centre of the room, which creates a division of the rooms. To the left of the counter there are tables for groups and to the right are smaller tables enough for couples or singles. As you keep walking past the kitchen – which has a glass window that allows you to peek in and see the chefs creating food magic – there are booths for a more private catch up. As the name suggests there is a main focus on coffee and it sure doesn’t disappoint. There is a variety of coffees available – both black and milk. Code Black Coffee roasts high grade beans from international farms and growers, and there is a Code Black seasonal blend, as well as a rotating single origin which is roasted in house, signature blends and decaffeinated coffee. These different varieties of coffee can also be bought over the counter as well and staff are willing to assist to so that you walk away with the perfect coffee. N got a house-blend expresso and I got the house-blend latte. I thoroughly enjoyed my latte with its nutty and velvety smooth flavours. The expresso comes with additional water which I think is thoughtful in order to modify the coffee if need be. Later on we also got a flat white which was just as delicious and creamy. Definitely one of the better coffees that I have tasted – and I do want to go back and try out some of their other types of beans. The fritters at Code Black Coffee had ingredients that I haven’t usually seen in a fritter dish – Broccoli, Almond & Chia Fritters with Grilled Corn Salsa, Coriander, Avocado & a Poached Egg. When the dish came out it was beautifully presented on Japanese style plates – with the fritters as a base, topped with the avocado and poached egg, with the corn salsa and coriander surrounding the elements. The fritters were absolutely delicious! They were full of broccoli, almond and chia and were flavoursome. You don’t usually think of this combination but it really did work – and coupled with the avovado and corn – there really was a party of flavours that happen in your mouth. I loved this dish! There is also a selection of cakes and pastries which look fresh and tasty which are displayed at the front counter. Code Black Coffee is wonderful place that exudes class and style and the menu is one of my favourite cafe menu’s that I have come across – there are so many dishes that I want to come back and try – its a shame you can only do one dish a visit =p I will definitely be back to visit and try out as many dishes as I can. Atmosphere / Ambience: Elegant, Classy and Stylish yet welcoming and engaging. Service: Friendly and Knowledgable – they really do know their stuff about coffee and are always ready to help. 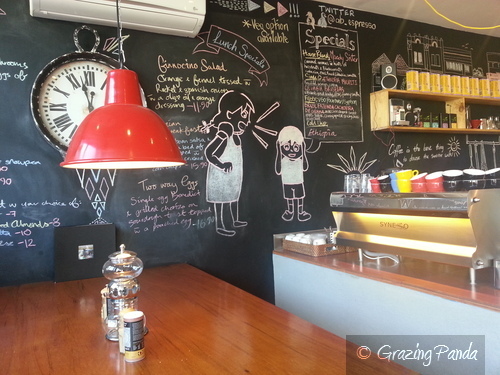 Inside Annoying Brother – love the chalkboard wall! Annoying Brother is one of my new favourite cafes. Located on the hustle and bustle of Nicholson Street, Annoying Brother, owned by Julian Moussi, is a small and cosy cafe. There are large accordian windows which make the venue bright and happy, as well as letting a cool breeze in. There is a blackboard wall filled with Lunch Specials, Breakkie Specials as well some funky and artistic drawings and quotes. This all adds to the playfulness and fun-ness of this place. The menu (can be found above) is simple yet different. There are interesting dishes on the menu such as Silly Eggs – soft poached eggs dropped in Napoli sauce with chorizo and feta, The MeBrother which is honey glazed ham with creamy scrambled eggs on an english muffin, as well as everyone’s favourite Smashed Avocado and Homemade Pancakes. There is also a Breakkie Burrito to try as well as a generous range of paninis, focaccias and salads. I ordered the Smashed Avocado with a side of Mushrooms and N ordered the ‘Tetris’, which is a “build your breakkie” option that starts with a foundation of eggs of your choice on toast with extras. The Smashed Avocado was simple yet tasty and just the kind of dish that I needed on this Saturday morning. I definitely want to come back and try out some of the other dishes on the menu especially the Silly Eggs. and some of the delicious cakes that are made fresh. 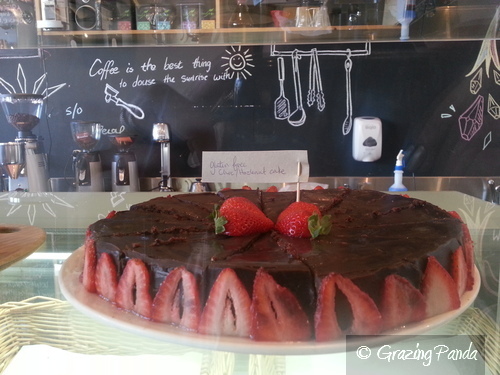 How scrumptious does the chocolate cake with strawberries look in the picture above. This cafe is not just about the food, but about the coffee as well. You can select from V60 Pourover, Syphon and Cold Drip styles. The coffee is creamy and nutty and tastes delicious. There are tables and chairs located outside in the sunshine to enjoy your meal or read the paper. There are also seats located on a high bar overlooking the road which are funky to be seated on as well. The staff are friendly and happy to offer their opinion if you can’t decide on what dish you want. Definitely come and try out this place – its on my list of breakkie/brunch places to try! 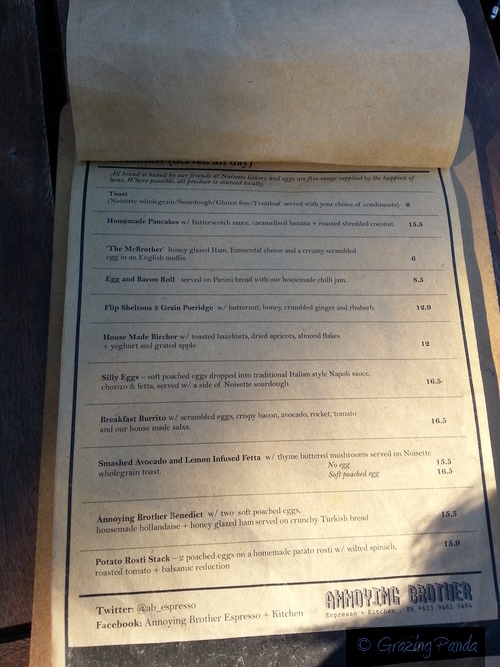 Menu – Breakfast and Lunch Menu – refer to the menu pictures above. Atmosphere / Ambience: Casual, Relaxed and Friendly – great for a weekend catch up! Service: Friendly, happy and helpful.